LAI Games has a new web presence to shout about at the upcoming Amusement Expo next week. 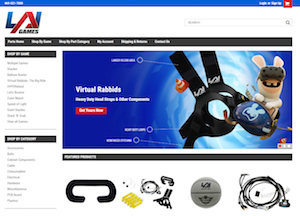 The company will be promoting its brand-new online parts store, which allows operators to easily find and order the parts they need for both current and legacy games. As a show bonus, those who stop by LAI Games’ booth 436 will also get a promotional code they can use for a discount on their next parts order. Alongside promoting the new store, LAI’s most popular titles will also be on display, including AMOA Innovator Award winners Hypershoot, Let’s Bounce and Virtual Rabbids: The Big Ride, which the company says operators are reporting as the top earning game in venues worldwide.